The input to a rectifier is ac whereas its output is unidirectional or dc. The electronic circuit which carries out rectification is called as rectifier. The block diagram of rectifier is as shown in fig. A step down xmer is used to reduce the ac mains voltage to an adequately small value. The terms ratio of the xmer is adjusted to obtained a stepped down as voltage. This voltage is converted into a pulsating dc voltage by the rectifier. 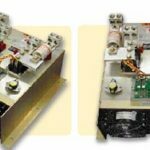 Every electronic circuit such as amplifiers needs a dc power for its operation. This dc voltage has been obtained from the ac supply. For this the ac supply voltage has to be reduced (stepped down) first using a step down xmer and then converted to dc by using rectifier. Single phase Ac supply voltage. The primary of xmer is connected to the single phase ac supply available from MSEB. This supply voltage has two terminals namely live and neutral. The voltage at live terminal with respect to neutral is sinusoidal. The positive half cycle extends from wt=0 to ∏ radians. In this half cycle live (L) is positive with respect to neutral (N) and the secondary voltage VAB is positive. The negative half cycle extends form wt=0 to 2∏ radians “L” is negative with respect to “N” and secondary voltage VAB in negative. In half wave rectifier the rectifier is ON only during one half cycle of the ac supply. So output is produced only in that half cycle. The output is suppressed in the other half cycle. The conduction takes place only in one half cycle of supply. Hence the name is HWR. RL is the load resistance. The resistance of the diode in the ON state be RF and let the resistance of the secondary winding be RS. In the positive half cycle (0-∏) of the ac supply the secondary voltage VAB is positive i.e. A is positive with respect to B. Hence, the diode is forward biased and starts conducting. The equivalent circuit of HWR for the positive half cycle as the diode starts conducting the secondary voltage VAB appears almost as it is across the load resistance. The load voltage is thus positive and almost equal to the instantaneous secondary voltage VAB. The load current has the same shape as that of the load voltage since the load is parley resistive. The instantaneous load current il is equal to the ratio of instantaneous secondary voltage (VAB) and total resistance (RS+RF+RL). In the negative half cycle of ac supply (∏ to 2∏) secondary voltage VAB is negative i.e. A is negative with respect to B. Hence, the diode is reversing biased and offers a very high resistance. Hence, we can replace it by open circuited switch. The load is disconnected from the secondary. Hence, the load voltage and load current both are zero and the voltage across the diode is equal to the instantaneous secondary voltage VAB. The circuit is called as half ware rectifier because it deliver power to the load during only one half cycle of the ac supply voltage. The rectifier outputs consist of Ac as well as Dc component the ripple factor measures percentage of Ac component in the rectifier output. The ripple factor indicates how close the rectified output is to the pure ideal dc voltage waveform. So it is a fig. of merit for the rectifier. Small values if ripple factor indicates that the rectifier output waveform is close to being pure Dc. The ideal value of RF should be zero and practically it should be as small as possible. This is the maximum negative voltage which appears across as non conducting reverse biased diode. The max negative voltage across the diode is Vm when the diode is none conducting. 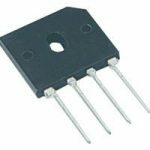 The term PIV has been used to denote the maxm reverse voltage capability of a diode but commonly it is used to denote the maximum reverse voltage that occurs across the diode. We must select a diode which has a PIV rating higher than the max possible negative voltage i.e. Vm to ensure safety of diode. Otherwise the diode will enter into the breakdown region and get damaged. The full wave rectifier consists of a step down centre tapped xmer T1, two diodes and a purely resistive load RL. In HWR the load current flows only for one half cycles and in FWR the load current flows for both the half cycles of ac supply. Before we analyze the full wave rectifier first we knows the concept about the voltages induced on the secondary sides of a centre tapped xmer. The induced voltage in the two halves of the secondary winding are always 180 out of phase with respect to each other. In the positive half cycle of ac supply the polarities of the secondary induced voltages are shows that VAO is positive and VBO is negative. Due to the centre tapped secondary, VAO and VBO are always equal and opposite to each other. Hence the diode is D1 forward biased and D2 is reverse biased. The load current starts flowing from A through D1, load resistance RL back to point O. The instantaneous load voltage is positive and approx equal to VAO AS the load is resistance the load current il has the same shape as that of the load voltage. In the negative half cycle of the ac supply the polarities of secondary induced voltages show that VAO is negative and VBO is positive. Hence D1 is reverse biased and D2 is forward biased so D1 acts as open circuited and D2 carries the entire load current. Note that the direction of load current il is same as that ir, the positive half cycle. That means even in the negative half cycle, the load current continues to be positive. The instantaneous load voltage VL is positive and almost equal to VBO. Load voltage and load current both are positive in both the half cycles of the ac supply. Output voltage is available in both the half cycles of the ac supply. 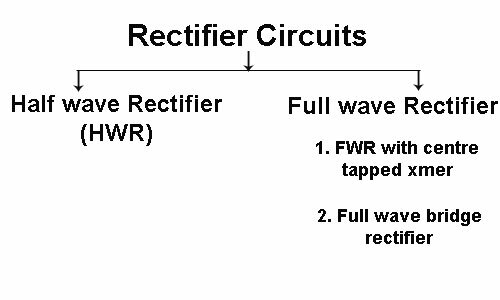 The full wave rectifier circuit consists of two half wave rectifier which works independently and feed the common load. In order to compare the performance of ckt with HWR. The peak load current Im. RF = Forward resistance of diode. Low ripple factor as compared to HER. Higher values of average load and average load current. No possibility of transformer core saturation because transformer current flows equally in both the half cycles. Since PIV of the diodes is 2Vm, size of the diodes is larger and they are most costly. Cost of the centre tapped xmer is high. Power supplies for various electronic circuits. The disadvantages of the full wave rectifier such as high PIV and compulsory use of centre tapped xmer are overcome in the bridge rectifier. The circuit consists of four diodes connected to form a bridge. The centre tapped input xmer is not required the i/p xmer T1 is a step down transformer. Bridge rectifier offers full wave rectification. The diode conducts in pairs i.e. at any given instant of time one pair of diode either D1 D2 or D3 D4 will be conducting. In the positive half cycle of AC supply the secondary voltage VAB is positive. Therefore diodes D1 and D2 are forward biased where as D2 and D4 are reverse biased. The equivalent circuit for this interval shown note that the reverse biased diodes D3 and D4 acts as open switches. The load current and load voltage both are positive. In the negative half cycle of ac supply the secondary voltage VAB becomes negative diode D3 and D4 are forward biased and starts conducting. D1 and D2 are reverse biased hence do not conduct. The Equivalent ckt for this interval is shown. It requires a small size transformer. Centre top xmer is not required. This makes the bridge rectifier cost effective. The input transformer is not a must. It is possible to operate the bridge rectifier directly on the 230 V ac supply. Rectifier efficiency n is high. Transformer utilization factor TUF is high. This ckt is most suitable for high voltage application. This is because the maximum negative voltage that appear across each diode is – Vm. Therefore the diodes with PIV rating of –Vm volts are required to be selected (PIV in FWR is –2Vm). Core saturation does not take place. Therefore xmer josses are reduced. Core saturation is avoided because equal and opposite currents flow through the xmer in each cycle. The PIV is only Vm volt which is half the PIV of FWR with centre top. The number of diodes used is four instead of two for FWR. As two diodes conducts simultaneously, the voltage drop increases and the output voltage reduces. Dc power supplies for various electronic circuits.